Vibrant IB Technicolor 35mm Print! 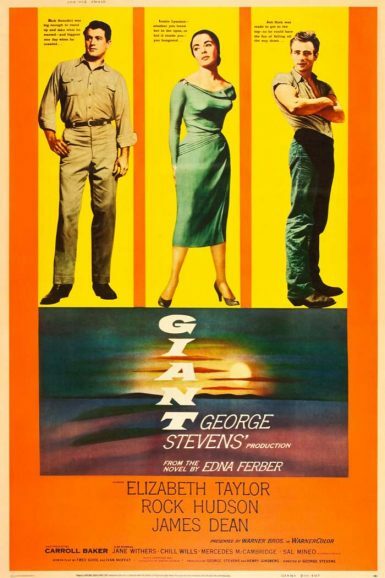 A vibrant expression of 50’s Technicolor Hollywood, Giant is a commanding, wide-open movie with a palette as varied as life itself. George Stevens was a skillful enough director to master both the endless dusty acreage of this elegiac frontier saga about cattle ranchers and oilmen and the meticulous human moments between leads Rock Hudson, Elizabeth Taylor, and James Dean. He spent over a year in the editing room. This is a multi-generational epic, which renders early 20th century Texas with a striking iconography only overshadowed by Dean’s insanely natural performance as outcast-turned-robberbaron Jett Rink. It was also a significant influence on There Will Be Blood and features memorable supporting performances from Dennis Hopper, Carroll Baker & Sal Mineo. Check out a collection of promotional stills for Giant on the New Beverly forum. Ariel Schudson discusses Giant on the New Beverly blog.